Dredd: Krong Island. Still loving this and great reference to the cover of Prog #5. Apart from a slightly portly Dredd in one panel Jake Lynch's art is fantastic. The Returners: A new thrill and intrigued enough to be looking forward to more. Nice to see a brief Gill Man reference. Lawless. Astounding. Superlatives fail me as the town's situation gets even worse. Charley's War feature. Looking forward to the definitive edition and interested in the details of the restoration process. Robert Bliss and the Clown feature. Not read it yet. Cursed Earth Koburn. Carlos and Koburn. 'Nuff said. 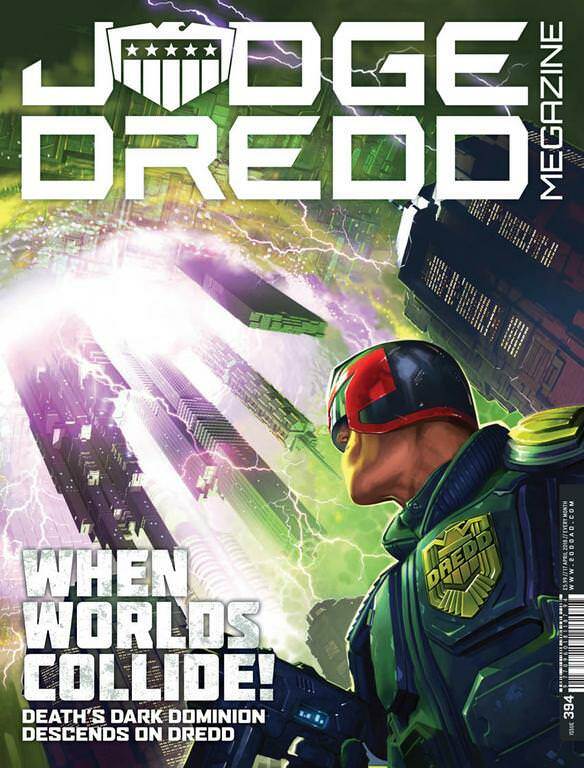 Dredd, The Dead World: What a stonking great issue of the Meg this is. Thrill buffers to maximum. And there's Dreddlines and the floppy is Outlier vol 3. A great Meg all round, one to pass on to any non believers. Re: Meg 394 - When Worlds Collide! Yep. That was quite the double package to hit the doormat on Saturday — this and the current prog. It's another fantastic Meg, extending a run of superlative form. Long may it continue. Yes the Meg been going strong for a long time now. This issue again was great. I always choose the wrong time to dump the Meg (which I do every now and then, most recently a few months ago). I don’t feel the loyalty to it that I do to the prog, which I will never ever drop. There have been too many times when there’s just been an ok Dredd and little else, and I find myself barely reading it. But the latest line up sounds good. Where’s a decent jump in issue in recent months - start of the current Lawless run? Some middling text pieces. The Charley's War one is good but doesn't tell me anything new alas. Movie Dredd is really well thought out and I'm enjoying this immensely its a really noce fresh take on the Dark Judges and the art is subline... as you can see bottom up starts pretty high! The Returned wow what a way to draw you into a new story. FANTASTIC - loved this and in many a Prog and/or Meg this would have been pick of the bunch but here it has very stiff competition. Oh hey have we seen Nicolo Assirelli before - loved that art. Regular Dredd well its regular apes vs giant apes, and hopefully setting up Dredd driving robot ape, who know but with Jake Lynch's art getting better and better what's not to love. Amazing. Lawless nothing more to be said is there. Pure comics. Christ the Meg is good at the moment. Colin- Nico Assirelli illustrated a strip for FutureQuake 2017 and did a bang-on job. Really pleased to see him make the jump to the big time. Set your thrill-containment-cardigans to maximum, it’s yet another strong Meg! Well worth a re-read of the last three Megs for each thrill. Very nice indeed!